The dramatic seasonal retreats and thinning of sea ice, record-setting seawater temperatures and multiple observations of biological changes in the Pacific Arctic sector precipitated an international workshop to evaluate ecosystem response to climate forcing. In May 2009, NOAA convened the Biology-Sea Ice Workshop comprised of 20 national and international scientists, including physical, geochemical and biological field scientists and modelers. A key outcome of the workshop was an EOS article entitled “Biological Response to Recent Pacific Arctic Sea Ice Retreats”. In addition to an overview of observed biophysical changes in the ecosystem, the article suggested a framework for the development of a biological observatory by international members of the Pacific Arctic Group (PAG; http://pag.arcticportal.org ). 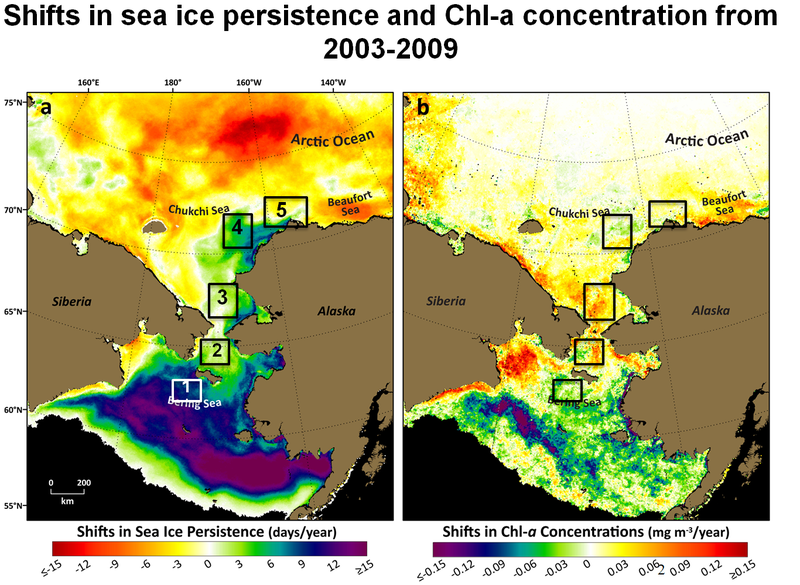 The “Distributed Biological Observatory (DBO)” is envisioned as a change detection array along a latitudinal gradient extending from the northern Bering Sea to the Barrow Arc [map of sites and example of change in sea ice and Chl-a]. DBO sampling is focused on transects centered on locations of high productivity, biodiversity and rates of biological change. The DBO sampling framework was initially tested during the successful 2010 Pilot Study, which consisted of international ship occupations of two of the DBO sites, one in the SE Chukchi Sea and one across upper Barrow Canyon. 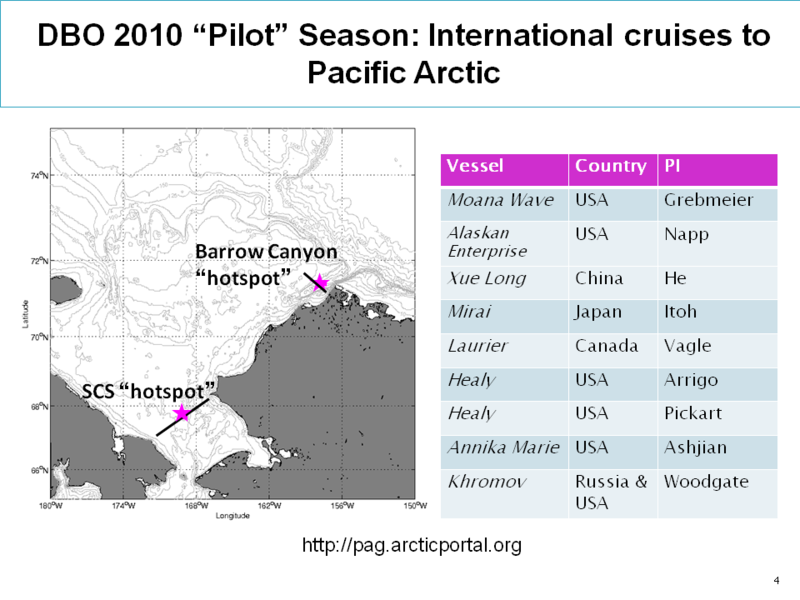 Provisional results of the 2010 Pilot Study were the central topic at the December 2010 PAG meeting in Tokyo, Japan, and at the March 2011 DBO workshop in Seoul, Korea, held immediately prior to the international Arctic Science Summit Week. Approximately 90 people attended the one-day DBO workshop in Seoul, including invited speakers who presented ideas for efforts to expand the DBO concept to the Eastern Arctic. In addition, provisional data sets were presented and planning efforts for the 2011 Pilot Study were initiated. 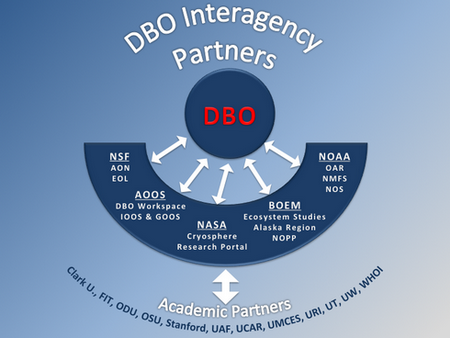 Notably, several U.S. agencies have endorsed the DBO concept in the Arctic research planning documents, including: (1) the 2010 NOAA Arctic Strategic Plan, (2) aspects in the BOEMRE Alaska Region planning efforts in the Chukchi Sea (COMIDA-Hanna Shoal), (3) statements in the recent USGS Science “Needs to Inform Decisions on Outer Continental Shelf Energy Development in the Chukchi and Beaufort Seas Alaska” document, and (4) interest by the Shell-ConocoPhillips-StatOil environmental program to occupy the Barrow Canyon DBO line in 2011. Perhaps most importantly, the DBO is specifically included in the draft US National Ocean Policy Strategic Plan. In addition, the Marine Working Group of the International Arctic Science Committee (IASC) has endorsed the DBO, is supporting similar activities in the Atlantic sector of the Arctic, and will co-sponsor the DOBO workshop in Victoria, Canada in November 2011. Also, the IASC-SCAR bipolar action group for the Arctic and Antarctic recently identified the DBO concept of latitudinal transects and stations as a possible mode for biological observations in the Antarctic, too. The DBO IT is now focused on bringing together data from 2010-2013 sampling efforts, to demonstrate the value-added of this national and international, sampling shared-data approach to the investigation of biological responses to a rapidly changing Arctic marine ecosystem. Expanding from the Pacific Arctic sector, the DBO will also serve as a framework for international research coordination via the Arctic Council Circumpolar Biodiversity Monitoring Program (CBMP), and is recognized as a task of the pan-arctic Sustaining Arctic Observing Network (SAON) program.